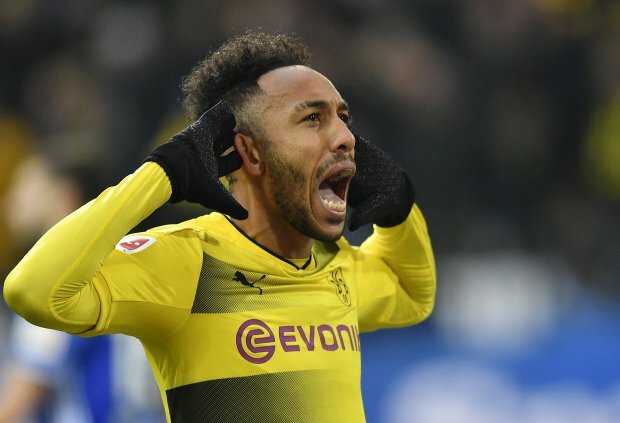 Premier League side Arsenal have agreed a club record transfer fee of £55.5 million for Pierre-Emerick Aubameyang. The Gunners agreed the fee with the German Bundesliga side with the deal dependent on a complicated set of deals also involving their league rivals Chelsea. Chelsea were looking to get two players from Roma: Emerson Palmeieri and Edin Dzeko. However it seems both sides could not agree on transfer fee. The Blues turned their attention to Arsenal’s forward Olivier Giroud. With Arsenal looking at bringing in the Gabon international, Giroud would have to make space. Dortmund were willing to sign the Frenchman but the player didn’t want to leave London because his wife had just given birth to their third child. Everton and West Ham had earlier shown interest in Giroud but the player, due to family reasons, wanted to remain at his current home. Chelsea decided to enter the deal but only once Arsenal had dropped their asking price from £30-35 million (which they are unwilling to meet) to a much more conservative £17m. The deals depended on so many factors but they all were completed before the deadline on January 31st. Aubameyang will be a transfer signing record for Arsenal and he became the highest earner at the Emirates with his £180,000 a week deal. Fans are flooding to this website to buy tickets for his first match, which is expected to be against Tottenham. With the 29-year old exiting the Bundesliga, Dortmund were looking at Giroud as replacement but since the player didn’t want to move, they turned their focus on to Chelsea’s Michy Batshuayi, with this part completing the trio of deals. Chelsea offloaded Batshuayi and got Giroud. Arsenal offloaded Giroud and got Aubameyang, and Dortmund offloaded Aubameyang and got Batshuayi! Champions League Draw: Can the English Progress?